I had $30 in Kohl’s Cash and a pair of Chucks with holes in them. Sometimes I start in the kids’ department when I go shoe shopping. It’s a technique that those of us with small feet know well: a women’s 5.5 (my size) is about a girl’s 3.5. The former is nearly impossible to find, the latter much more common (and cheaper!). But this strategy does tend to limit your options to things like white sandals and Spiderman sneakers. At my Kohl’s, kids’ Converse only come in boring pink and black. So, hoping against hope, that day (the day I dragged my husband along with me), I went to the women’s shoes. I marveled at the long display of rubber-soled canvas. Red, black, blue, purple. I have a life-long love of Chucks. I wore plaid knock-offs for years in elementary school. I wore green hightops like a badge of honor to emo concerts in college. Emo street cred, heh. I started checking boxes for my size and found grey with purple piping in a women’s 6; that would do nicely. I tried them on to check, and they were definitely more comfy than my current navy pair falling to pieces. I was about ready to walk to the check out when I saw them: Size 6. Sky blue. My favorite color. They were beautiful. This is a dilemma I seldom have; finding 2 pairs of shoes in my size is rare. I couldn’t justify buying both when I’d counted on the Kohl’s Cash to cover the bulk of the price. Five years ago, I would have bought the blue with no hesitation. And that realization hit me in the gut as I sat there with a different color shoe on each foot. Five years ago, when I was in college. Do people with full-time jobs and mortgages wear blue shoes? I’m not in college anymore. I’m not a teenager. The grey shoes were less flashy and more…mature. He told me to get the grey ones. When I ask him these things, he’s always right. 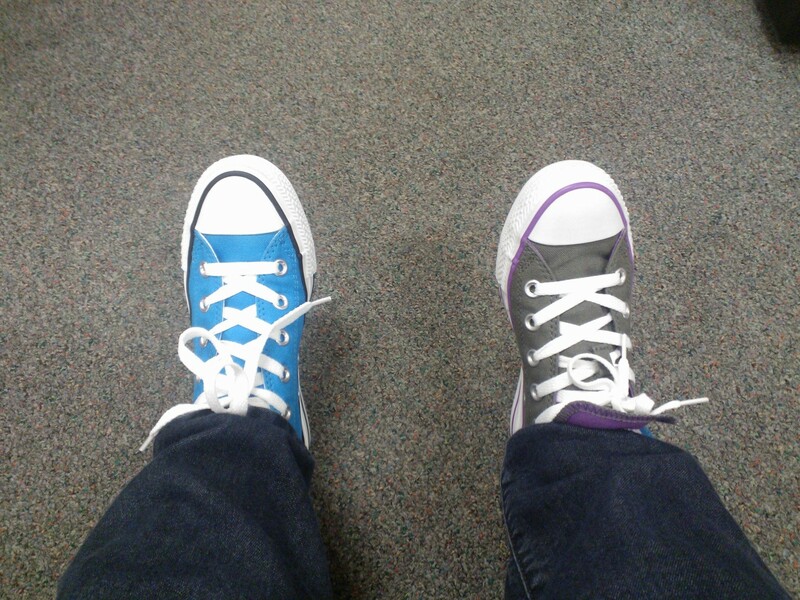 I put both pairs back on the shelf while we finished our other shopping and I could savor the last 15 minutes of the time in my life when I still thought I could wear bright blue Chucks unironically. Then I bought the grey ones. And my husband will probably never go shoe shopping with me again. Maybe if I promise I won’t have a mental breakdown next time? I’m clearly older and geekier than you, because I have learned that you don’t have to buy gray when you want blue. If people don’t like your blue…well, who cares? I did go on to buy both red and yellow shoes this summer, so I haven’t totally given up colored shoes. I never will! But those are flats as opposed to sneakers. I’m quite short and only a few years into my career, so I don’t need any addition encouragement for people to not take me seriously. The less I look like a college student, the better 🙂 And I love my Chucks too much to not wear them at all anymore. Thanks for stopping by! I really enjoyed looking over your blog as well.